It would be wrong to visit Bydgoszcz or Torun and not sample the cultural highlights of these two cities. Here you’ll find a comprehensive list of tours and short day trips with which to keep you entertained. 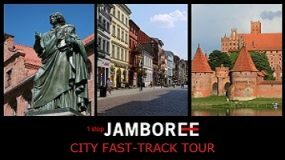 When you see a tour you like, click “Add to basket” to include it in your Bydgoszcz and Torun Jamboree. Do all your sightseeing in one nice and easy go with our unique Torun City Walking Tour.